January 1, 2012 - Ushering in the New Year with a spiritual message that challenges us to greet the new opportunities in life. Like wine, Life is acidy. It eats away at you. Life doesn't always follow as you predict - "Life is something that happens to you while you are busy making other plans." - John Lennon. Here are some pointers for the new year and the direction of life, any day of the year. 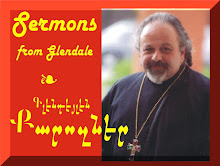 Recorded LIVE at the St. Peter Armenian Church & Youth Ministries Center in Glendale, California on January 1, 2012. Fr. Vazken also comments on the disgusting way the Glendale Armenian community has sold out Christmas.